Neti pots have been used for centuries to irrigate and flush germs, congestion from stuffy nasal passages and to ease pain for people with colds, flu, sensitivities to allergens, and also as a daily or weekly ritual. Previously, the use of neti pots was recommended when dealing with sore throats, as in the case of tonsillitis and inflammation of mucus membranes. Everyone knows how soothing it feels to gargle with salty salt water when the passages burn, sting, feel swollen and irritated. Even though this common practice around the world has always been deemed safe, when practicing this cleaning methods, certain safety steps must be taken as our world and waterways becomes more polluted and contaminated. Because the water that is sniffed and trickled through the sinuses may also be sucked up to the brain, caution must be taken that bacteria, viruses and other one-celled organisms like amoeba do not get a free ride straight to the main brain stem and the headquarters of our neurological functioning and intelligence. If a person begins using the neti pot due to cold symptoms it may be hard to differentiate or recognize that an amoebic infection has implanted itself in the brain when the person already has lethargy, fever, headache, nausea, loss of smell, vomiting and stiffness. Due to the rapid course of this disease leading to death, this type of amoebic infection is most often misdiagnosed as acute bacterial meningitis and delayed for specific treatment. Physicians may look for differentiating symptoms of intermittent abdominal pain and convulsions. Most cases occur during the summer months when the temperature rises and humidity increases leading to growth of thermophilic amoeba. One PBS special infers that a higher incidence of infection occurs in young boys where water may enter the nose when playing roughly together. Symptoms of amoebic infection leading to meningitis and brain inflammation come on quickly and besides typical flu-like symptoms more extreme signs like stiff neck, light photophobia, loss of balance, brain seizures, and hallucinations, most likely from a high fever, indicate a severe condition that may lead to death in 3 to 12 days. Get thyself to a hospital immediately! An infection by these one-celled organisms may occur from more than just tap water used in a neti pot, but in those swimming in ponds, coastal waters, hot springs, lakes, wells, swimming pools, infected waterways, irrigation ditches, water discharge from industrial plants, Water heaters with temperatures less than 47°C, splashing of holy water, drippings from air-conditioners and also potentially from contaminated soil or the air. Always wash your hands, do not put dirty hands in the nostrils or in the mouth. Even though the amoeba will not infect the brain when ingested always wash before eating. Naegleria fowleri is not a contagious disease spread from one human to another. Lab work | A high number of neutrophils or neutrophilia, the primary white blood cells that respond to a bacterial infection especially pyogenic infections will indicate infection. Since first isolated incident was in 1962, The Center for Disease Control [CDC] records only 111 deaths that may have been caused by Naegleria fowleri since that time. In 2007, there was an outbreak in Lake Havasu, Arizona. Six people died from the brain-eating amoeba. Interestingly, although millions of people are exposed to the amoeba, but scientists today still do not know why some people go on to become infected and exhibit symptoms and death, while the majority do not. Once the brain becomes infected, 95% of those people will die. Recently 2011 cases illustrate the rapidity which a person may be affected if the water used in a neti pot from tap water has been contaminated. 13 Cases Reported | An increase in primary amoebic meningoencephalitis cases may be attributed to rising temperatures, reduced levels of chlorine in potable water, or deteriorating water distribution systems from ceremonial water washing called ablution. From F.P.O. Nägler, an early 20th century bacteriologist, and Malcolm Fowler, an Australian physician. In 1912, A. Alexeieff proposed a new genus for questionable amoeboid forms, which he named Nägleria in honor of Nägler’s work in identifying amoebae that pass through a biflagellate stage. Fifty-three years later, a report from Australia described human meningoencephalitis caused by an amebo-flagellate, later recognized as a member of Naegleria. In 1970, the pathogen was designated Naegleria fowleri after Fowler, who obtained one of the first isolates from human brain tissue. 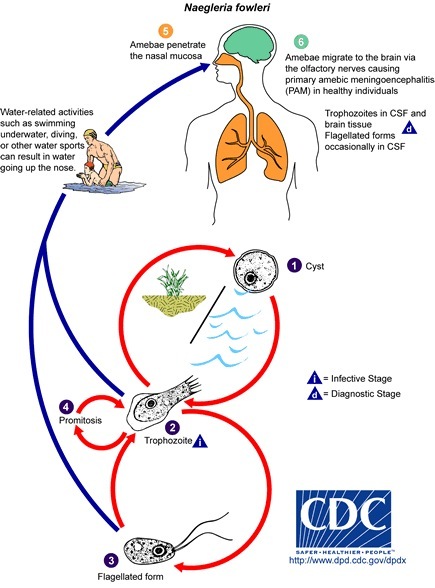 An infection occurs only when the infected water is forced up the nose of a human host. Once there, it travels through the olfactory nerve into the brain's frontal lobe, where it feasts on brain cells and multiplies. As global warming increases the temperature of the earth and the northern regions have warmer year-round temperature, the spread of these organism will increase. followed by the grained entoplasma. What can you do? Use bottled sterilized water or boil the water before you put it into the neti pot with that small bit of salt. I would imagine you need a salt prepared especially for the neti pot. Thai Patients With Primary Amoebic Meningoencephalitis | "PAM is the most deadly infection of the central nervous system apart from rabies. It is rare but fatal. Since the first report in 1965, fewer than 200 cases have been reported worldwide, from the United States, England, Eastern Europe, Africa, and Asia. [1,2,4] However, the causative organism is thermophilic and grows well in tropical and subtropical climates, so most cases have been reported from those areas. In Thailand, PAM has been sporadically reported since 1983. " In two other cases, intravenous amphotericin B for 14 days and oral rifampicin and oral itraconazole for 1 month cured the patient with no recurrence. The use of chlorine in swimming pools can reduce the population of bacteria and Naegleria. Reduction of rate of amoeba growth and spread in pipes supplying water to homes through sanitation, filtration and individuals boiling water before use. Keeping your head above water when sitting in a geothermal pool will protect you from amoebic meningitis. Geothermal water can be found in natural outdoor pools, poorly maintained private home pools, public swimming pools, spas in hotels, motels, health centres and gyms and stagnant water. Holding the nose shut or use nose clips when taking part in water-related activities in bodies of warm freshwater. Digging in, or stirring up, the sediment while taking part in water-related activities in shallow, warm freshwater areas. A modern Indian textbook combining material on homeopathic theory & practice, general medical information on diseases (e.g. etiology, signs & symptoms, conventional treatments, prognosis, complications), materia medica and therapeutic notes. A much needed book on Practice of Medicine along with Homeopathic management of all diseases. It covers all the conditions & diseases of various systems in a comprehensive way (easy to understand & remember simultaneously). The exclusive added feature is the mention of predominant miasm & homeopathic therapeutics of all condition given in the book. A seperate section on emergency has also been included. For the convinence of students, book has been divided into three broad sections. This book proves the fact that medicine not is a tough subject and that medicine certainly can be understood from a homeopathic point of view also.